How small charities can work together to create greater impact – Mondo CEO, Stephen Carrick-Davies, talks about how collaboration can bring great dividends. Theodore Roosevelt got it right when he said, “Comparison is the thief of joy.” How many times in our social and professional lives do we get pulled down into the corrosive spiral of comparison? It’s not just young people who can feel drained by the ‘Boast by Post’ social media culture; it’s permeating into our education system and our workplace. Even politicians and presidents seem obsessed with tweeting about their achievements, constantly comparing themselves and showing how they are bigger or better than their perceived rivals. But is this “compare and despair” culture prevalent in all areas of our society? What about the not-for-profit world, where values and the ethos of serving the vulnerable should be centre stage? Having worked for and led dynamic non-profit organisations all my working life, it has saddened me that many charities are becoming fixated with comparing themselves, competing with each other and in some cases deliberately trying to outscore one another in the frantic race for securing donors, celebrity endorsements or big government aid contracts. 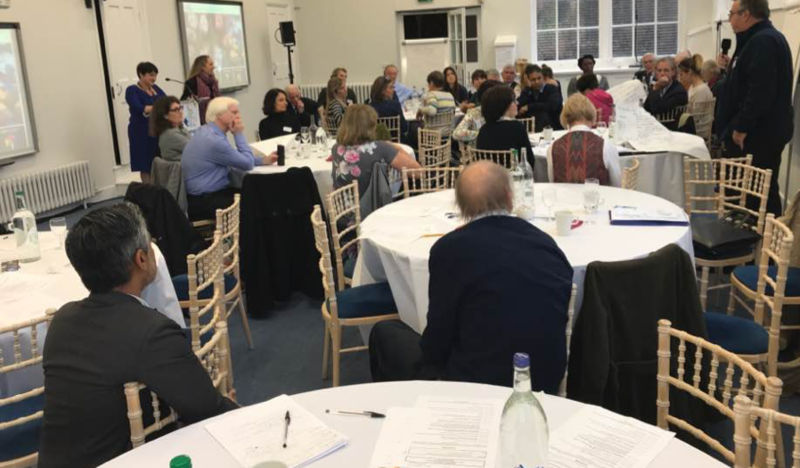 How refreshing then for me to attend yesterday’s inaugural conference where 30 small charities came together to ‘pool’ their knowledge, share their successes and even admit their mistakes, of working in one of the poorest nations in the world: Nepal. The BRANNGO (Britain and Nepal NGO) Network has been established by charities themselves to enable co-operation not competition. In an age of austerity and fluctuating exchange rates, international charities need to find innovative ways to collaborate and partner together; As one of the presenters said at the event we need to “find new ways to create a bigger bang for our donors’ buck”. And he’s right, this collaboration is not just about efficiency; it’s becoming crucial in securing funding to develop long-term programmes which build sustainability, break dependency and show evidence of nation-changing impact. One of the reasons why many of us present at the conference are inspired by, and love working with national partners in Nepal, is because time and time again we are humbled by the gentleness, courageous and resilience of the Nepalese people. Despite the most appalling natural disasters such as earthquakes and floods, they remain some of the most gracious and welcoming people on earth. 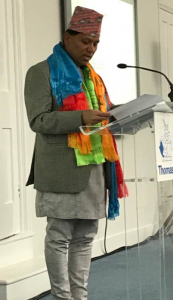 As His Excellency, Dr Durga Subedi, the Nepali Ambassador to the UK, said in his welcoming address to the conference; “In my country, guests are gods.” He shared stories from the 200 year history of the relationship the UK has had with Nepal, his appreciation for the British dedication to justice, liberty, education and providing aid. He thanked the UK NGOs for the extraordinary work many of them had done in the mammoth reconstruction effort after the earthquakes in 2015 and very much welcomed the formation of BRANNGO. At the conference we heard from practitioners who were working with Nepali NGOs on community-led programmes. Practitioners shared news of ground-breaking permaculture initiatives which could transform subsistence farming. We learnt about health outreach programmes in remote communities. New quality education and pedagogy programmes were being co-designed with teachers, at the same time as new earthquake-resilient schools were being built. However, we also heard about the desperate exodus of workers leaving Nepal for the Gulf States and the need to provide greater employability training in Nepal so both adults and young people can secure decent employment and establish businesses and livelihoods. As one recent report states, “The earthquake has renewed calls for a different kind of development in Nepal, one focused on creating more and better employment within the country” . Those of us who work in the International Development field hear time and again the old proverb of not just “giving a family a fish” but “teaching them how to fish.” Yes, that is true for long-term change, but to stretch the metaphor further, we as charities also need to find ways to weave our nets together to affect even greater change and ultimately change the fishing industry! Small charities are cost-effective, nimble, able to prototype new initiatives, build good reciprocal relationships with donors and most importantly work closely with local partners on the ground. We don’t have the resources for external partnership managers or parliamentary officers, but initiatives like the BRANNGO network could be the start of the ‘weaving’ of a new larger, stronger ‘net’ and help us collectively go up-stream and scale up strategic programmes whilst at the same time measure more robustly our collective impact and legacy. When I mentioned to one of the donors of my organisation that we had ‘mapped’ the work of all the other UK NGOs working in Nepal and were committed to partnering and not duplicating effort, the funder said, “How refreshing, I wish more charities would do that”. She was right. This is a good example of charities doing the right thing and perhaps the formation of BRANNGO is a model which charities working in other regions of the world could emulate and replicate. As I left the conference I remembered a quote from the American film producer Irving Thalberg, who said, “Credit you give yourself is not worth having”. He’s right, uultimately this is not about us as UK charities, our brand, or our achievements; this is about the people we serve. We must and should find better ways to learn from them and together, so that our work, however small and valuable is impactful and leads to lasting change and sustainability. See this article for a wider piece on this tension.